Zdarsky, Sawicki & Agostinelli partner, Guy J. Agostinelli, is mentioned in this Buffalo News story. Dr. Andrew Covey objects to plans to build four townhouses on a lot between his mansion, the Asa Silverthorne House, and the DeRose Mansion next door on Delaware Avenue’s Millionaires’ Row. 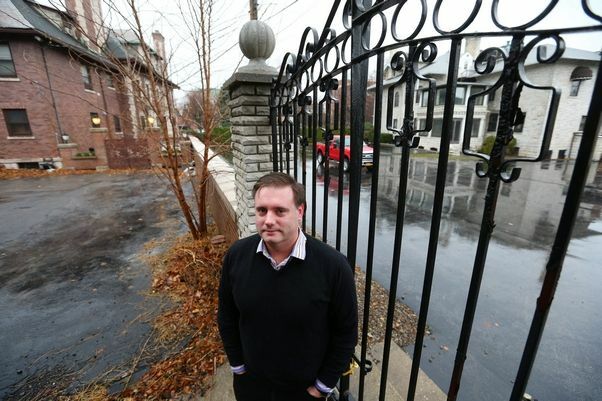 There’s a bit of a neighborhood spat occurring on Buffalo’s Millionaires’ Row. In May 2006, Rock Doyle and Dr. Andrew Covey spent about $520,000 on the Asa Silverthorne House at 877 Delaware Ave., and then spent several hundred thousand more dollars fixing up the 6,000-square-foot brick residence and buying the carriage house in the backyard. Now, a group that includes Buffalo architect Karl Frizlen is planning to buy the DeRose Mansion and carriage house next door at 891 Delaware, and to make changes – including constructing four townhouses on the property. When completed, the group will have spent as much as $6 million. But on an avenue where views matter, Doyle and Covey say Frizlen’s planned townhouses would cut into their view of Delaware Avenue. And on a street where history has considerable value – aesthetic and financial – Doyle and Covey, along with some neighborhood leaders, think the Frizlen group’s plan doesn’t fit. Frizlen responded that his group is sensitive to the neighborhood, and even though the townhouse design was previously approved by the city’s Historic Preservation Board, he indicated the group is open to compromise. But, he said, the new townhouse rentals are necessary for the entire project – specifically the renovation of the 8,300-square-foot mansion and the deteriorating carriage house behind it – to be financially viable. The disagreement has been playing out in recent weeks at the Buffalo Planning Board, which is being asked to approve Frizlen’s townhouse plan. The board this week tabled the proposal to give the opposing sides a chance to work out their differences. Doyle, a health care administrator, and Covey, a physician, said their mansion was split into nine apartments and a law office when they bought it in 2006. They have since converted the residence into two units, a main home they live in and a third-floor apartment they rent out. In 2012 they purchased, for $230,000, the carriage house behind the main house, which they also use as a rental unit. Doyle and Covey have an expansive view of Delaware Avenue from the northern side of their home, as a parking area on the DeRose property separates their mansion and the DeRose Mansion. The Frizlen group has a contract to buy the now-vacant DeRose Mansion and a carriage house on the 1.1-acre lot. The carriage house would be turned into a single-family residence where one of the investors intends to live. The mansion would be split into four high-end apartments. The four new townhouses, approximately 40-feet high, would be built on what is now the parking lot south of the mansion, abutting the Silverthorne mansion property. The new building would be 15 to 25 feet from the Silverthorne mansion – different distances at difference points because the buildings, as proposed, would be angled, the Planning Board was told. Right now, Covey said, he and Doyle are the only owner-occupants in one of Delaware Avenue’s mansions. Over the years, the brick or stone turn-of-the-century mansions, which once housed some of Buffalo’s wealthy businessmen and entrepreneurs, were sold and subdivided into apartments, or taken over by nonprofit organizations or private businesses. Asa K. Silverthorne, a lumber merchant, built the Silverthorne House in 1906, the same year the Orin Foster Mansion was built at 891 Delaware. The Foster Mansion was later sold to DeRose Food Brokers and renamed. Other remaining mansions on the east side of Delaware Avenue date back as far as 1885, according to city property records. But also on that side of the street are an apartment complex built in 1961 and an office building built in 1970. Across Delaware Avenue, original mansions still stand, but are now home to various organizations, including a charter school, the International Institute and the Red Cross. The street is “a mix of buildings,” Donna Muscarella, part of the ownership group selling 891 Delaware to Frizlen’s group, told the Planning Board. Muscarella’s ownership group bought the property in April 2013 for $777,000 with plans to fix it up as an investment. But those plans fell through. During this week’s Planning Board meeting, Muscarella distributed to board members photographs showing some of the more contemporary buildings on the street. In response, Peggy Moriarty, one of the neighborhood leaders, said past mistakes don’t justify future ones. The city’s Historic Preservation Board approved the Frizlen group’s townhouse design in October. “They helped us a lot to create a façade that would blend in,” Frizlen said. The Frizlen group’s original plans, for contemporary-style townhouses, were rejected by the Preservation Board, said board chairman Paul McDonnell. Revised plans that met Historic Preservation requirements for such things as materials, scale and design were approved, he said. The Historic Preservation Board’s review is based on U.S. Department of Interior standards, and is separate and independent of the Planning Board’s review and decision. Covey and Doyle said they would have attended the Preservation Board review if the city had notified them about it. They learned about the project, they said, when the city notified them of the Planning Board review. The city is not required to and does not send neighborhood notifications for Preservation Board applications, as it does for Planning and Zoning board ones, said Brendan R. Mehaffy, executive director of the city’s Department of Strategic Planning. The only exception, he said, is when a property is considered for historic landmark status. The Preservation Board generally deals with such things as window and roof design issues, while the Planning Board considers construction and neighborhood impact, he said. The city requires Preservation Board review before Planning Board action so residents can review Preservation Board decisions as part of the more comprehensive Planning Board review, he said. “The preservation [review] can be viewed by the public at the Planning Board,” he said. Regardless of what the Preservation Board thinks of the Frizlen townhouse plans, the project still must get Planning Board approval. Frizlen said his group’s project meets all city codes regarding setbacks, housing units and other criteria the Planning Board reviews. In fact, he said, city regulations would allow as many as 38 apartments on the lot. But just meeting setback and land-use requirements is not enough to win Planning Board approval, said Guy J. Agostinelli, an attorney for Covey and Doyle. The Planning Board, he said, also is required to take into account the impact of a project upon its neighbors.